Whenever I peruse a makeup counter my eyes & grubby mitts always gravitate towards one particular shade when it comes to lips and cheeks. PEACH. Utterly perfect flatteringly lovely peach, it just looks so much more natural on me than any pink i've ever come across to the point where I think I own one pink blusher. As per usual when I was attending the RMK/JolieBox event we were free to have a play with the cosmetics on offer & I immediately applied this lipstick, to say I squealed when I was told it was in the goody bag is a gross very sad understatement. 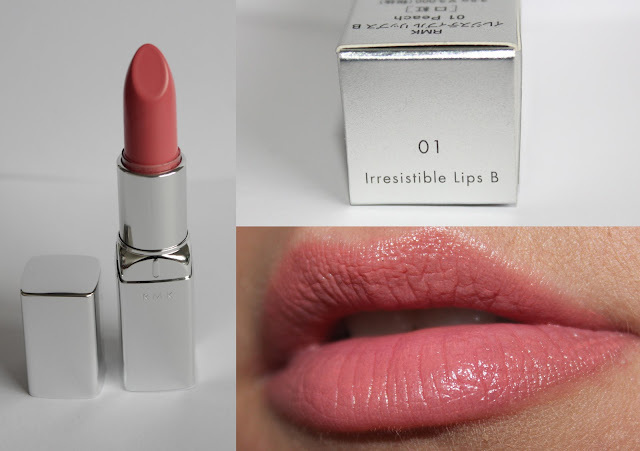 This is seriously a gorgeous lipstick, the texture is so creamy & not at all drying, it is my perfect peach shade, not too light and too opaque that it washes me out like some lipsticks I own (read YSL Rouge Voulpte) I can apply it from the bullet & it is smooth & even or dab it on my lips & blend in with my finger for a more natural effect. It is all I have been reaching for recently as it's so effortless to apply. At £19.00 it isn't the cheapest of lipsticks but for that payday treat I think it's worth it for that special shade that is perfect for you. RMK are a Japanese cosmetic brand that are available in Selfridges or BeautyBay/Look Fantastic online, I have been a huge fan for a few years, their base products are fantastic and I have never been let down by any of their products. If you do have a chance to have a nosey at the counter definitely check out their primers, foundations and their skincare! I will have a few more reviews coming up & if I get chance I will be talking about them when I film a video this week. Have you tried any RMK products? What's your favourite? That is the perfect pink too, so beautiful! I love peach lipsticks. Pretty!